Nearly every dentist who prepares for earning a DDS or DMD degree undergoes endodontic training that establishes the basic skill set for performing root canals. The complexity of the procedure, frequent requirement for special instrumentation and overall difficulty in performing the procedure successfully on a consistent basis forms the basis, nonetheless, for Endodontics becoming a specialty that is often acquired as a Post Graduate Degree level of specialization. RCT's, as a procedure, have a high incidence of retreatment need due to a variety of events and/or tissue conditions that often are not adequately diagnosable at the outset of treatment. 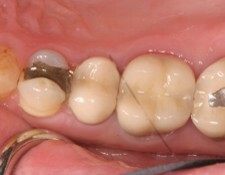 Hidden or branched canals can obscure the efforts of the best endodontist. That which can't be seen.... usually can't be treated adequately. High bite pressures, as they exist in the molar regions of a patient's occlusal plane, can easily destroy a molar tooth that has had numerous fillings. The growing ratio of filling material (amalgam or composite) will render whatever the remaining amount of healthy tooth structure to fail. Similarly, the procedures involved in a routine root canal can also impact the stability of a healthy tooth structure that almost "unknowingly" causes a RCT failure. Retreatments of a failed root canal may not succeed for many patients, especially certain "constitutional qualities" of the tooth are not fully known. The use of RCT as a diagnostic "tool" by some dentists has impacted their use OR replacement of the treatment. 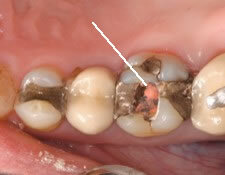 The adjacent picture above shows a molar that has substantial amounts of amalgam filling. Pain and discomfort symptoms reported by the patient, for this dentist, raises the consideration of RCT as an additional diagnostic step. 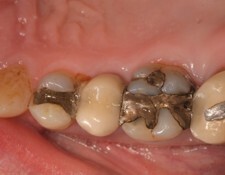 The "unknowns" regarding the amount of tooth structure that has already been removed, assumptions about the endurance effects of previous treatment and assumptions about additional excavation of healthy tooth material will have a direct bearing on treatment success..... not of the RCT specifically.. but rather the recommended "treatment of choice." 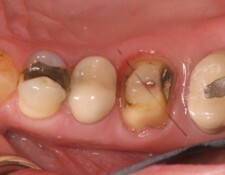 The 2nd treatment photo shows how a large opening has been made that provides a full view of the interior of the tooth. Strong magnification and diagnostic dyes are used to closely evaluate the condition of the remaining tooth structure.... with special attention being focused on internal cracks, fissures, fractures and almost imperceptible hair line cracks. Evidence of anything that suggests, even remotely, that an imperfection can extend downward into the pulpal floor or where nerve tissue once existed, results in an immediate recommendation of an extraction and dental implant replacement. 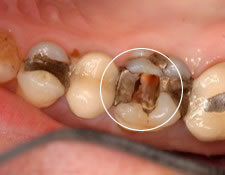 A fracture line that is suspected to run laterally through the pulpal floor also signals extraction and replacement. High bite pressures can make nearly any incorrectly root canaled tooth fail quickly. RCT retreatment costs are cumulatively very expensive whether in the short run or over a long span of time. An implant replacement is the only restorative treatment that thrives in a high bite pressure environment. The adjacent photo reflects that the remaining tooth structure is sound and free of additional defects, as determined by the exploratory analysis. Subsequent to canal tissue removal, gutta percha placement begins. All remaining compromised tooth structure is carefully removed to assure no unusual imperfections develop that can accrue to overly aggressive tissue removal (heat). The cementation surfaces of the buildup are created with a multifaceted feature that adds stability to the new molar crown. Obtaining a "perfect" impression for a tooth in a molar location is probably more critical than for any other tooth structure. The biting and chewing forces are extreme. The slightest variance from an idealized cementation interface can make a crown wiggle and rock in no time at all... potentially destroying the buildup, compromising the root canaled structure and likely rendering the crown unusable for re-cementation.